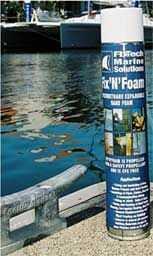 Fix'N'Foam - Hand Foam, is CFC-free polyurethane self expandable foam adhesive filler designed for use in filling cavities of all kinds, in all conventional substrates found in the boat construction and repair, machinery manufacturing, commercial vehicle and the building construction and repair industries. Can be trimmed, sanded and painted after full cure. Surface should be clean and free from dust and oil and other release particles. Moistening of the substrate surfaces improves adhesion, increases curing rate and creates a denser cellular structure. To all surfaces including yourself and your clothes except for PE and PP high-density plastics. Therefore please wear disposable clothes and protective gloves to ensure good hygiene standards. Protect Fix'N'Foam from UV radiation by painting or applying a coating of say FixSeal MSP15 adhesive sealant.